When sixteen-year-old Aly King is the grand prizewinner in the "Win a Date with Dakota" contest, it seems like a dream come true. Along with her best friend Desi, and soap star wannabe sister Missy, she flies from Colorado to Hollywood for her celebrity date. Like every other girl in America, Aly knows that Dakota Danvers is a smoking hot movie star. What she doesn't know is that he's also Satan's son. Luckily for Aly, in the City of Angels there is one actual angel, Jameson Dagon. Granted, Jameson is a fallen angel, but he has one last chance at salvation if he can derail Dakota's evil machinations. Can Jameson protect Aly and Desi from Dakota's damning influence, put up with Missy's prima donna antics--and ignore his smoldering attraction to Aly? Aly King won a contest by EnterTEENment Magazine to meet Hollywood's new heartthrob, Dakota. But little did she know that Dakota is Satan's son and feasts on human vibrations and energy. And then there's Jameson, a fallen angel, currently working as Dakota's P.A. , his mission is to stop Dakota from doing whatever evil plan he has brewing. Overall, Hollyweird was fun! Terri Clark's invented a cute story with amusing characters and she's got a pretty good sense of humor. This book made me laugh more than once. I absolutely loved Des! She's the quirky best friend that you love despite the zillion flaws. Jameson was pretty cool too. That cellphone of his was absolutely brilliant! I liked most characters, the annoying sister Missy and fun best friend Des. Best of all was Aly, a non-believer, being forced to witness things she never thought existed and believe. The only weird part was Jameson and Aly's romance. It developed too quickly and out of nowhere before they spent any real time together but once I got past the initial weirdness of the first few chapters, the rest of it flowed quite smoothly. 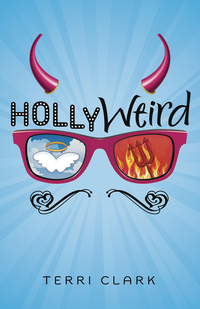 Hollyweird is the kind of book I'd borrow at the library or purchase at the airport to keep myself entertained - it's fun, light, quick and enjoyable!